9 5/8 by 12 1/2 in. “Everybody knows that Barye is a great sculptor… but what is less known is that he is also a remarkable painter.” In 1860, art critic Gustave Planche revealed a previously unknown fact about the preeminent animal sculptor of the 19th century and major figure of the Romantic movement. Barye was also a talented painter, probably owing to his training in the studio of Antoine-Jean Gros (1771-1835). Little was known about Barye’s work in oil during his lifetime; his reputation was primarily based on his sculpture, which he exhibited regularly to great critical acclaim at the Salon and also to his work in watercolor, which provided him financial security. In fact, his work in oil (approximately 100 paintings) only became known after his death - during his posthumous exhibition at the the École des beaux-arts in 1875, and the following year at his estate sale. 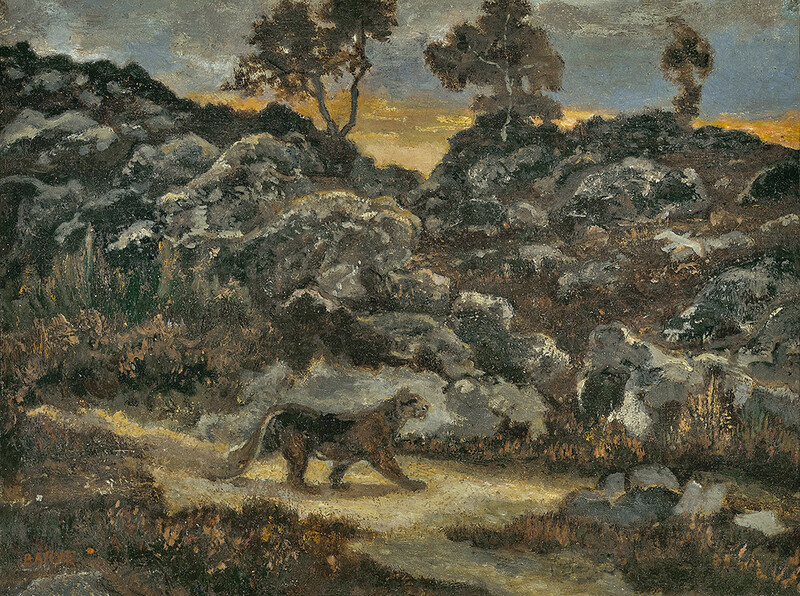 The present work, which was featured in his 1875 posthumous retrospective, is a rare example of a Barye oil, and the only work showing a couguar hunting a bird. 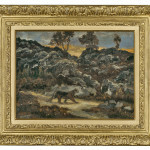 The boldly brushed landscape is characteristic of Barye’s work in the Forest of Fontainebleau, where he joined a colony of artists in the nearby village of Barbizon in 1841. 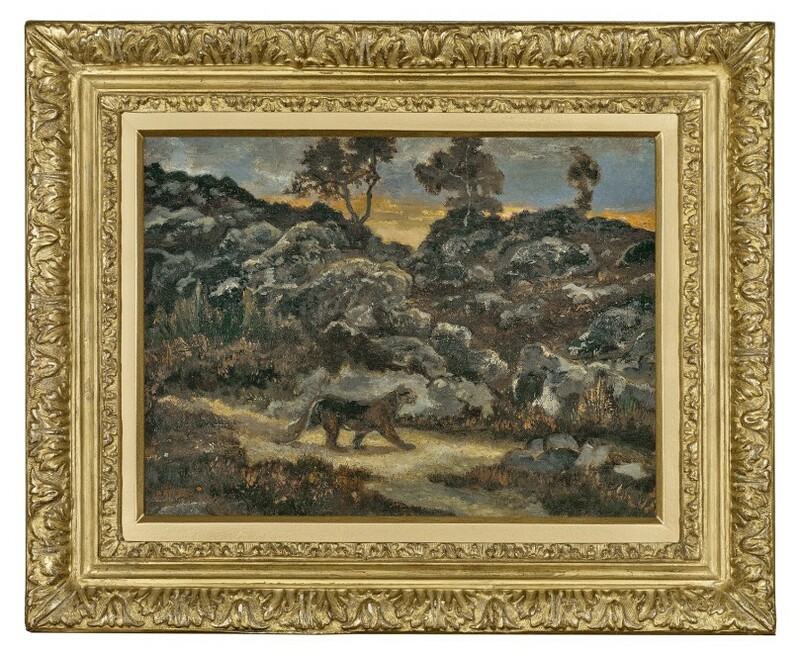 In Barbizon, Barye met Théodore Rousseau (1812-1867), who considered him the “greatest artist of the age” and he also collaborated with Camille Corot (1796-1875). In fact, it is believed that Barye sketched the lion, the leopard and the wolf in Corot’s Dante and Virgil (Museum of Fine Arts, Boston). Barye painted the untamed landscapes of Fontainebleau for much of the 1850s and 1860s, and like his fellow artists, he was most fascinated by the forest’s landmarks, including Bas Breau, Belle croix and les Gorges d’Apremont. However, unlike his Barbizon colleagues, Barye never introduced human figures into his landscapes but instead incorporated wild animals. 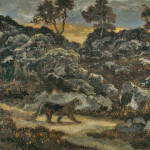 Les Gorges d’Apremont, with its desolated sandy clearings and prominent boulders, may be the setting in Couguar, but despite this incongruous habitat, “the ferocious beast seems to be at home.” Barye created this scene from his imagination, combining two of his favorite sources of inspiration: the dramatic landscapes of the forest of Fontainebleau, with the most exotic and wild beasts he regularly observed on trips to the zoo in the Jardin des plantes in Paris. This improbable landscape was not conceived as realistic but rather as a metaphor of nature’s power, grandeur and violence, emphasized by the stormy and fire-like sky, in which predator and prey seem to live in constant struggle to survive. “Tout le monde sait que Barye est un grand sculpteur…mais ce qu’on sait moins, c’est qu’il est aussi un peintre remarquable.” Gérard Hubert, “Barye et la critique de son temps,’’ La revue des arts, no. 6, 1956, pp. 223-230. Cited in Simon Kelly, “Barye as painter,” in Untamed, the Art of Antoine-Louis Barye, exh. cat., Walters Art Museum, 2007, pp. 43-51, p. 47. Eugène Guillaume, “Introduction,” exh. cat., École des beaux-arts, 1889, p. 16.